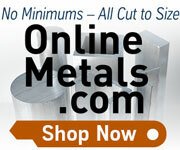 We offer an array of quick change tool posts for small lathes. You can choose from a range of sizes. Here is a page that will help you choose the correct quick change tool post set for your lathe. We only sell one style of quick change tool post; an Aloris quick change tool post and a copy of same. These tool posts are all-steel and use wedges to secure the tool holder. They are considerably more rigid than aluminum tool posts and are more repeatable than piston-style tool posts. We carry this style of tool post in three sizes (0XA, AXA, BXA), with sets configured for several different lathes. These are sometimes referred to as “Phase II” tool posts because Phase II was the first to import a copy of the Aloris tool post from China. In general, tool posts and tool holders are interchangeable in each size range. For example, pretty much any AXA tool holder will fit any AXA tool post. The 0XA is the smallest of the three sizes. The body of the tool post is 1.75” square and 2.5” tall. This tool post is a good fit for lathes up to 8” swing. We carry two standard sets in this size. PN 3112 has a cut-off tool holder that holds the cut-off blade horizontal. This allows the set to work with lathes with only 0.63” vertical distance from the top of the compound to the centerline of the lathe. This quick change tool post set bolts on to 7x10, 7x12, 7x14, and 7x16 mini lathes with no additional hardware. PN 3048 has a cut-off tool holder that holds the cut-off blade at the standard 4° angle. This set requires 0.75” vertical distance from the top of the compound to the centerline of the lathe. The only difference between the PN 3112 set and PN 3048 set is the cut-off tool holder; the tool posts are identical. The PN 3112 set includes the PN 3117 cut-off tool holder. The PN 3048 set includes the PN 3774 cut-off tool holder. Our 0XA quick change too post sets that are configured for specific lathes include either the PN 3112 or the PN 3048. Besides the quick change tool post sets, these products include special mounting hardware. The AXA quick change tool post is designed for lathes with swing from 7” to 12”. We carry the Aloris brand (PN 3876) and a less expensive version of a similar design (PN 2280). The BXA quick change tool post is designed for lathes with swing from 12” to 15”. Our BXA quick change tool post set is PN 3658. The compatibility table shows which quick change tool posts sets are available for several different lathes. Note that all these tool posts fit many more lathes than the ones in the list. If you lathe is not listed, look at how your tool post is mounted and find something similar. The compatibility table provides details of the tool post mounting. Even if your lathe is not listed, you can still figure out which QCTP will work on your lathe. For example, if your tool post mounts with an M8 bolt or stud, you can use the QCTP listed for the Prazi D400 lathe. The specifications table provides details about each quick change tool post set. Tool post LxWxH Including dovetails 1.75" x 1.75" x 2.5" 2.5" x 2.5" x 3.5" 3" x 3" x 4.5"
* Center height is the vertical distance from the top of the compound rest to the centerline of the lathe.